Do you have an image of a notable woman and you want to make her visible online? You can add her image to Wikipedia as part of the #VisibleWikiWomen campaign. Don’t know where to start? Here are 5 basic steps. Step 5: Celebrate! You just contributed to the #VisibleWikiWomen campaign. Thank you! 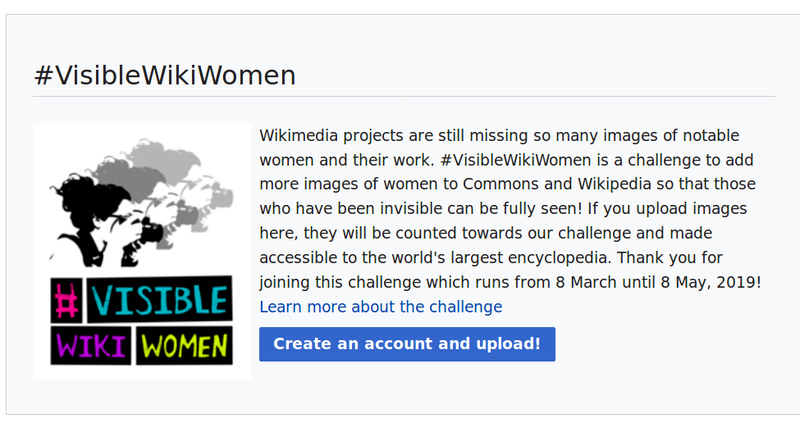 Go to the #VisibleWikiWomen campaign page and create your account on Wikimedia Commons. 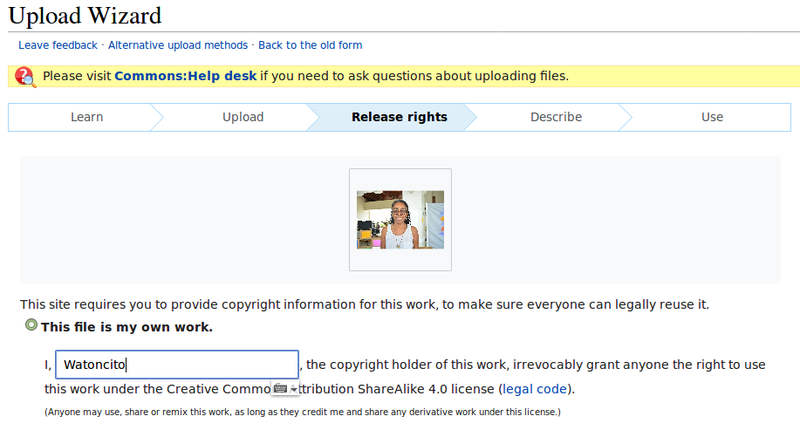 Why do I need to create an account on Wikimedia Commons before I upload my image? Are Commons and Wikipedia the same thing? 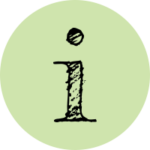 If you want to add an image to Wikipedia, you’ll first need to add this image not to Wikipedia itself, but to Commons where all the media files (including images) for Wikipedia are stored. If you already have a Wikimedia Commons account, just log in and follow step #2. Choose Select media files to share. Select the image file from your personal device and then Continue. Now that you have got to the Release rights step, don’t let this title scare you away! 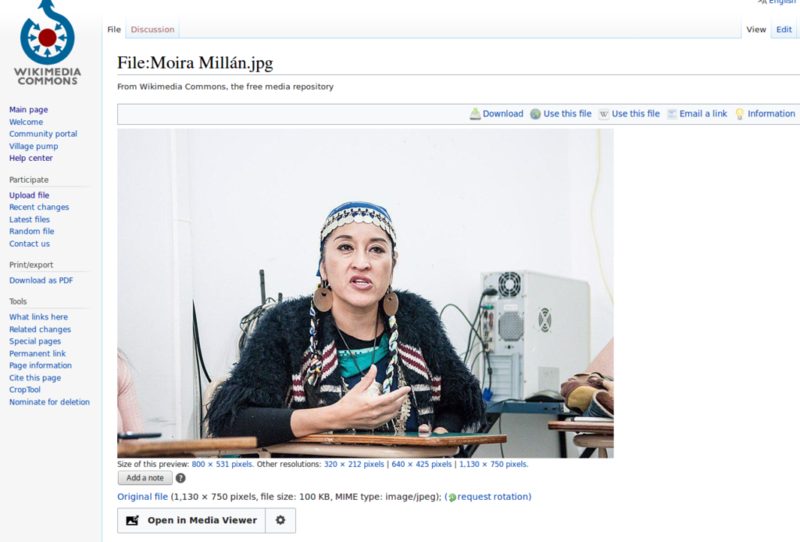 Wikimedia Commons, which is where the media files from Wikipedia are stored, needs to know that you have the rights or permissions to freely and openly share the image on Wikipedia. When you create something, like a photo, illustration, song, etc, you are the owner (also known as the copyright or rights holder) of that creative work. This is true whether you are an individual or an organization – and organizations can upload images to Wikimedia Commons too! You have the right and the choice to share (or not share) what you created. For this campaign, when you decide to add a photo of a woman that is not yet on Wikipedia, you are making the generous choice to offer the rights of that photo to the world, so other people can not only see it but also share, reuse, modify, remix, and basically interact with it in multiple ways, including in educational, non-profit and for-profit contexts. The most important part of the free and open Wikipedia license is that anyone who uses your work, must also acknowledge and attribute your creative contribution in their own use! Why does this matter? Wikipedia is a not-for-profit, free and open online encyclopedia. Anyone can read and modify Wikipedia without seeing ads or sacrificing their safety and privacy. Wikipedia serves the world by providing cultural and educational work that has been collectively created by volunteers from around the world. As we ask you to make more women visible on Wikipedia, we are also asking you to join in Wikipedia’s spirit of solidarity and collaboration. Thank you for your generosity! Now that you understand what it means to release the rights of your image, you will select the option This file is my own work as seen below. If you are an organization uploading images from your collection, this is also an option you can choose. In this example, this photo of Brazilian activist Jurema Werneck was taken and uploaded by the user Wotancito, and it is Wotancito’s own work. She took the photo, and she has decided to share it on Wikipedia under a free license. 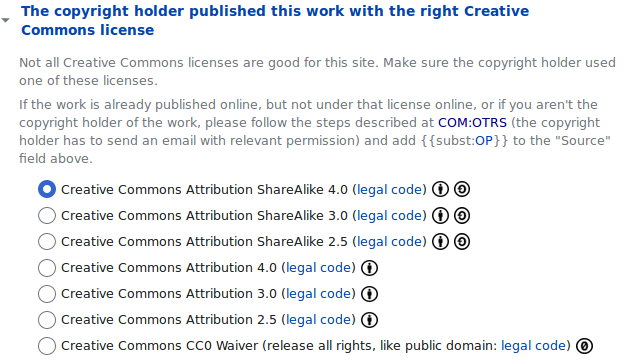 Creative Commons is an organization and community that provide authors and right holders of creative work with free licenses when they choose to share their work with the world. These licenses allow any creative work to be shared, reused and remixed. Wikipedia and Wikimedia Commons use Creative Commons licenses, including for image files, because the volunteer community believes in sharing knowledge openly and freely. You are almost done! Now go to Step 4: Describe your image. Now you will need to add the name of the person (or the organization) who took the photo. Just notice that both people and organizations can be copyright holders for images you may find. There are 6 different options you could choose from. In this guide, we will cover the 3 most common cases. Got a tricky case? Email us at visiblewikiwomen(at)whoseknowledge(dot)org for more help. The copyright holder published this work with the right Creative Commons license. If the photo has been downloaded from a website and has a Creative Commons license, select the same license used by the copyright holder. If you can, check if the image itself has a free license (some websites have free licenses but not all the images on that website are free!). The copyright holder published their photo or video on Flickr with the right license. 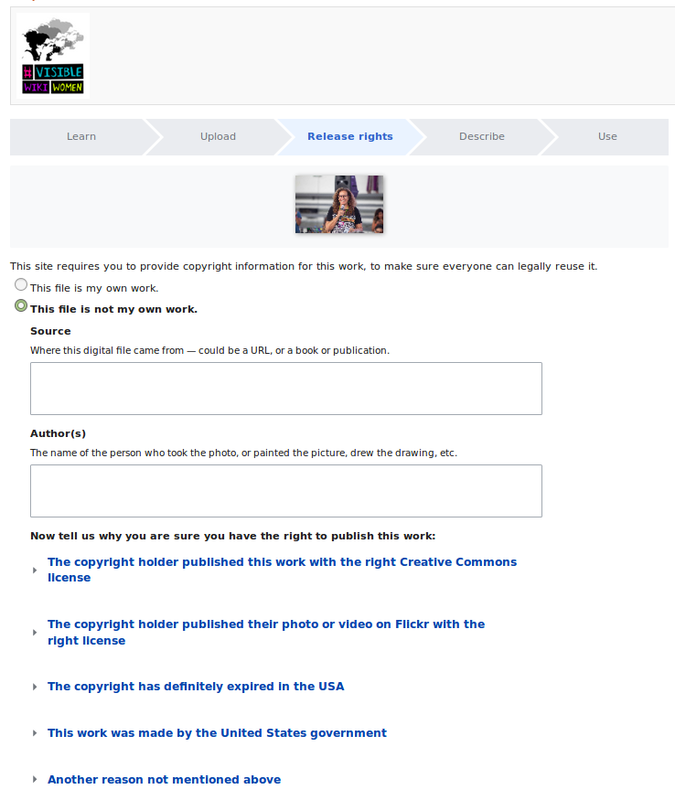 In this case, select the license used by the copyright holder on the Flickr page. Once you’ve made your selection, save your work and continue to the next step. If you have private permission to publish the image online, you’ll need to publicly demonstrate that it has been shared under a free license: please follow the steps described in the guide Getting and giving consent for images on Wikipedia – the creator will need to email a short note giving their consent. Please do this, so that the image is not deleted after you upload it. We don’t want your effort to go to waste! Now, you’ll need to describe the image you are uploading so that everyone will be able to find it. This step is important to make sure that your image gets used and the women you’re celebrating get seen! Title: Name your image something unique and descriptive, using plain language with spaces. If you can, put the name of the woman in your image title. Description: Briefly describe anything you know about the image. For example, you could mention the main things that are depicted, the occasion, or the place it was taken. Date: Say when the work was created or first published, as best as you know. If you know the exact date, we recommend you add it in the YYYY-MM-DD format. If you don’t know the date, don’t let that stop you. Use the pencil icon to add an approximate date or say you don’t have the exact date. 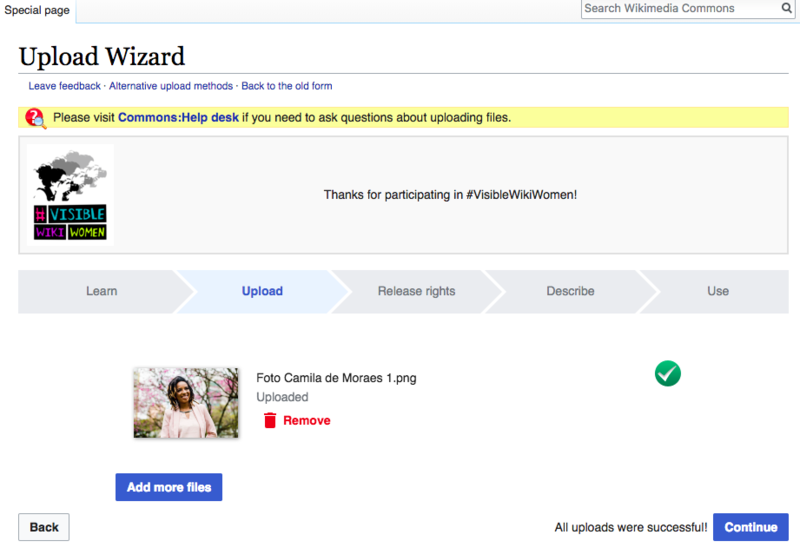 If you are a Commons pro and prefer to upload your image using something other than our campaign uploader, please remember to always use the category VisibleWikiWomen or subcategory for this current year along with other relevant categories, so we can find your images easily. For those using our campaign page, the basic categories will be added automagically for you! Once you’ve completed these fields, click Publish and your image will be saved. Step 5. Celebrate! 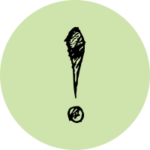 You just contributed to the #VisibleWikiWomen campaign. Thank you! 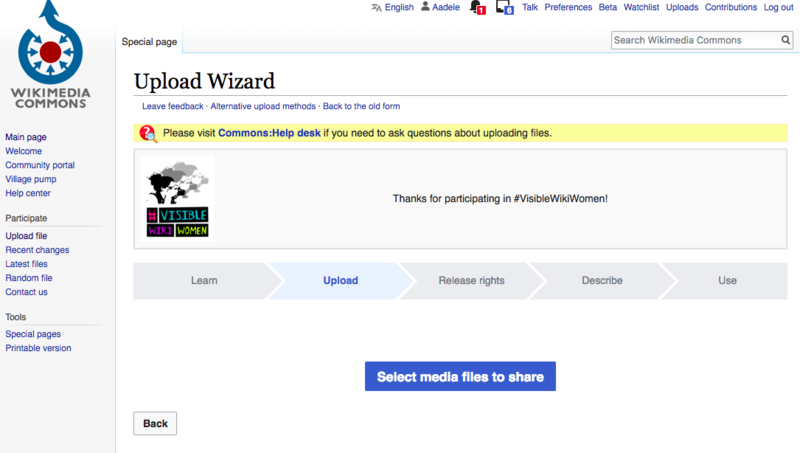 Learn more about the VisibleWikiWomen Campaign and other ways to get involved.